In today’s machining industry, automation is the key to a healthy and thriving production process. But when you add a robot to your workforce, you need to opt for flexibility. Long-term profitability requires a system that’s so flexible it meets your needs of both today and years into the future. Cellro is a first class developer of robotic automation for the machining industry. ‘Futureproof’ is the company’s core principle. A Cellro system is designed to increase your profits for years to come, thanks to a clever combination of a modular structure and intelligent software. When your production changes, only a Cellro system can adapt to your new needs. Xcelerate stands for all-in-one technology. The robot is capable of many diverse handling tasks, all at unrivalled speed and with utmost precision. Product change, pallet change, cleaning, deburring and 6-sided machining. Years of research and development enabled Cellro to bring so much functionality together in such a compact and accessible solution. That’s what we call Simply Revolutionary. So, what does Xcelerate entail for the people on the shopfloor? Their focus shifts from simple and mundane tasks to the more motivating overseeing task of process management. Xcelerate makes way for their full potential. Easytouch. Because Why Should Things Be More Complex Than Necessary? Why should a robot be any harder to operate than your mobile phone? Indeed, it shouldn’t. And with Xcelerate, it won’t. During Xcelerate’s entire development, we chose to keep things as easy as possible – but not any easier. Guided by the intuitive Easytouch Controls, anyone can fluently communicate with the robot at the touch of a fingertip. Program configuration is now a matter of minutes. No programming knowledge required. No new expert personnel needed. As a supporting robot, Xcelerate often works alongside humans. This raises the demand of perfect safety. Xcelerate is equipped with a first-class floorscanner, which is at all times connected to the Fanuc software. Never will the robot suddenly budge when people are in its presence. Even when someone enters the workspace during actual production, the robot will temporarily slow down its job in order to guarantee safe passage. 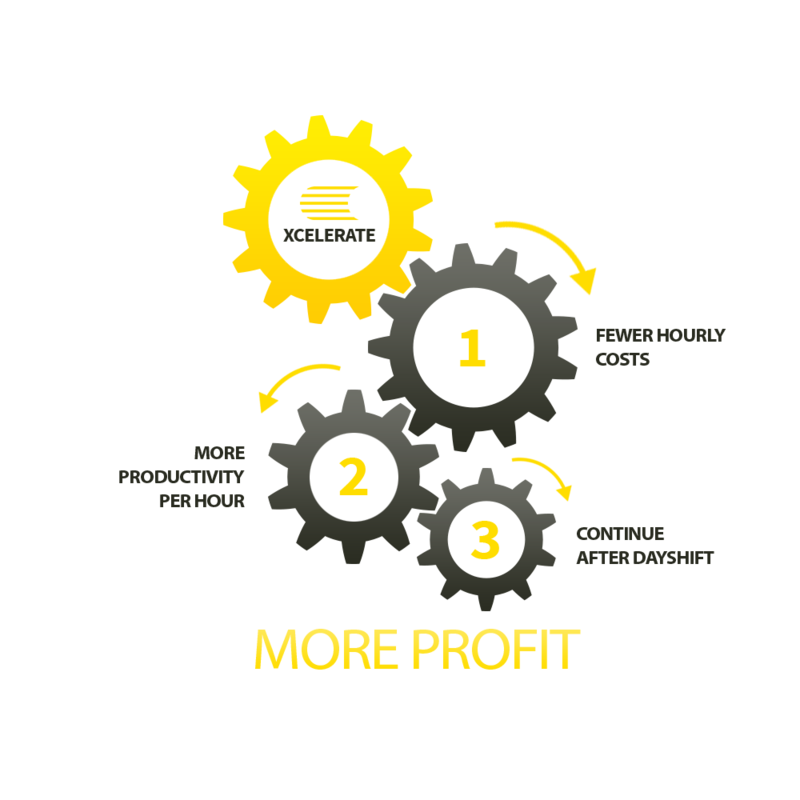 When you opt for automation, it is no secret that the aim is to increase your profits. And with Xcelerate, profits will certainly increase – even when you have yet to take your first steps into the world of unmanned production. Because of Xcelerate’s attractive price and rapid return on investment, one can automate feeling a high degree of certainty. While Xcelerate necessitates just a minor change in operations, it bears a major influence on your profit. In three key ways. It fuels maximum hourly production, at fewer costs and – if desired – until long after the regular dayshift. Today, profitable automation lies within reach for almost the entire machining industry. Xcelerate sets the standard in flexible automation with its compact size, user-friendly controls and movable construction. It was never easier to reap the benefits of unmanned production on your shop floor. As a result, Xcelerate earns itself back 1.5 to 2 times faster than any competing automation system. In a time where quality staff is scarce: Xcelerate is your ideal co-worker. Many compact automation systems offer little storage capacity, making them unsuitable for 24/7 production. Not in the case of Xcelerate. Its motorized drawers open so fluently that workpieces of diverse sizes and shapes can be stacked together in our smart inlays. This results in the highest storage capacity available, making Xcelerate the only automation system of its kind suitable for production up to 24 hours a day. This does not mean your Xcelerate needs to work around the clock to earn itself back. On average, Xcelerate reaches profitability at only 4 hours of employment per day. Xcelerate offers easy-to-use controls, enabled by dialogue control. Your own personnel can set up entire production programmes after a 1-day training. No expert needed. Yes, unlike enclosed automation cells, Xcelerate preserves full access to your machine. Your staff can keep a close eye on the production process. Yes, Xcelerate is capable of handling both products and pallets. Xcelerate doesn’t need a lot of floor space to do its job; 0.9 m2 (X10) and 1.4 m2 (X20-X35). Its tall build and sturdy three-point frame provide a compact yet rock-solid construction. Also, you don’t have to rebuild your factory floor to profit from automation. In almost any case, your Xcelerate can be deployed in the exact current factory situation. Yes, because the entire cell is built within a single frame with no loose components, it offers the valuable benefit of mobility. The entire system can be moved for a job at another machine in less than 10 minutes.